But if you go to Yonago, Matsue and Izumoshi from Tokyo, Nagoya, Osaka, Kyoto or other cities in east part of Japan, Limited Express Yakumo (やくも) that departs from Okayama (岡山) is much faster. On the other hand, if you access to Matsue or Izumoshi from Kyushu, Super Oki is faster. Please make sure the timetable at Hyperdia when you make your plan. Now let’s see this trains’ route, schedule and accommodations. There are three round trips altogether. Limited Express Super Matsukaze is operated between Tottori/Yonago and Masuda. There are 7 round trips. If you need a transfer among Sanin cities, you can use Super Matsukaze too. 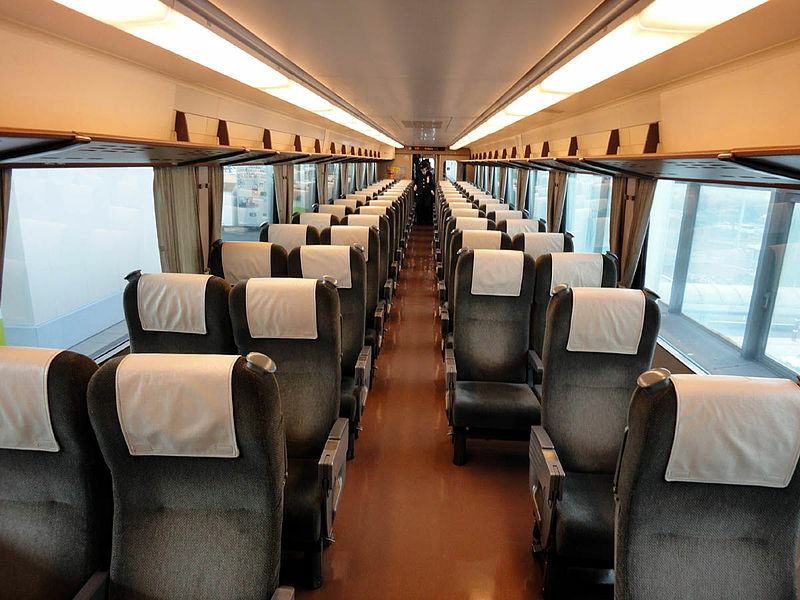 Please read the post, Inter-city train in Tottori and Shimane. Limited Express Super Matsukaze to get the details. Super Oki is operated by KIHA 187 series. There is only ordinary class. No Green seat is available on this train. The seat configuration is 2+2 and the seat pitch is 970 mm. There is no difference between non reserved seat and reserved seat. On board sales is not available. Please prepare drink or food if you want before boarding. Unfortunately there is only one image available. If is take this train from Matsue to Yamaguchi, is the ride fully cover by JR pass? Can the Sanyo-Sanin JR pass use for Super Oki and Super Matsukaze trains? Pls advise. Thank you. Yes, you can use the pass for taking these trains. What about Tottori-Liner, is it covered by Sanyo Sanin Pass as well? It’s covered too. All JR trains are covered. Next Next post: Sanin area train access guide. How to access to Kinosaki, Izumo, Matsue, Tottori and other major cities in Sanin area.